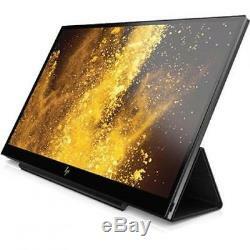 HP Business S14 14 LED LCD Monitor - 16:9 - 5 ms GTG - 1920 x 1080 - 200 Nit - Typical - Full HD - USB - 15 W - Black. Unfold dual-display productivity anywhere you work-on your own, in groups or at client sites-with the HP EliteDisplay S14 USB Portable Monitor, HP's first portable 35.56 cm (14) USB-CT display. Fold back the wraparound easel cover, stand up, and connect to your device with just one USB-CT cable. Perfectly portable Maximize your productivity and lighten your load with a Full HD display that weighs 1 kg and is less than 9 mm thick, so you can tuck it into your carrying case alongside your device without weighing you down. Easy USB-CT efficiency Set up quickly with just one USB-CT cable that transfers video and pulls power from your notebook or tablet - no power cable required. Customize your settings Control brightness, contrast, and response time, and activate HP Low Blue Light mode to filter blue light emission and shift colors to a warmer spectrum for more comfortable viewing, all from the intuitive OSD. FeaturingShare-worthy visuals Fold back the beautiful cover to reveal the 35.56 cm (14) diagonal IPS glass panel screen on HP's first portable Full HD display. It has 1920 x 1080 resolution, a 16:9 aspect ratio, and fast 5 ms response time-perfect for single and group viewing. Form meets function Carry a display that sets a style standard with an aesthetic that complements HP PCs. The smooth, easy-to-carry wraparound case helps protect the display when you're on the go, and is an adjustable easel on a desk or table when you stop to work. To extend your protection, select an optional HP Care service. EliteDisplay S14 14-inch Portable Display (3HX46AA). That is how we control costs and keep our prices so low. NO ADDRESS CHANGE IS POSSIBLE. The item "HP Business S14 14 LED LCD Monitor 169 5 ms GTG" is in sale since Tuesday, October 2, 2018. This item is in the category "Computers/Tablets & Networking\Monitors, Projectors & Accs\Monitors". The seller is "antonline" and is located in Atlanta, Georgia.